Design of Caza Azafrán facade. Source: Conexión Américas. Used with permission. Nashville’s immigrant population is expanding, and so is Conexión Américas. The April 21 groundbreaking of its soon to be headquarters, Casa Azafrán, marked the 10th anniversary of its existence. 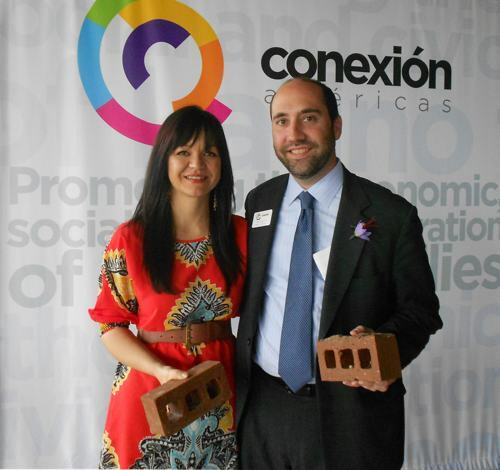 Executive Director Renata Soto and board member David Esquivel hold two of the bricks laid at the groundbreaking ceremony. Photo by Ralph Noyes. Sponsored by Activa 1240 AM. 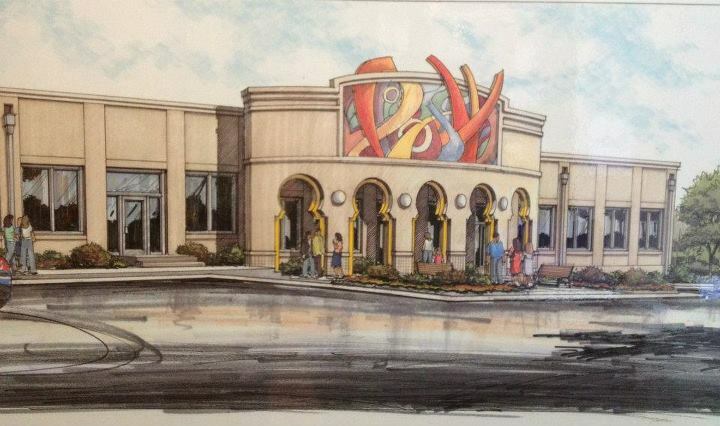 All waterpark tickets will be $19.99 plus tax -- a $12 savings. From 3:30 to 7:30 p.m., next to the Tin Roof, there will be vendors selling tropical paletas, sweet Latin pastries, Mexican pottery and art and Conexion America's own Rumba Roast coffee blend. Conexion America's popular house band, Rumba, will provide the sounds and energy starting at 6 p.m.
Bring a sombrero and your fiesta spirit to celebrate Cinco de Mayo at Solario inside Gaylord Opryland Resort's Conservatory atrium and enjoy a very special beer, tequila, and cooking seminar, plus a signature Mexican dinner. Come sample Cocoa Mole Beer by New Belgium Brewery, learn how tequila is made and see how Chef Paulina Suarez creates some of her award-winning salsas and entrees! Cooking seminar by Chef Paulina Suarez, showcasing how we make our award-winning salsas and Solario's signature Mexican Paella. *Per room for double occupancy, plus tax, resort fee and parking. Extra adult $44.50 plus tax each. Rates include restaurant gratuity. 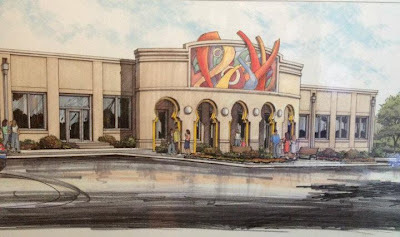 Atrium upgrade may be available for an additional $40 plus tax. Not retroactive or valid with other offers or groups. Other restrictions may apply. 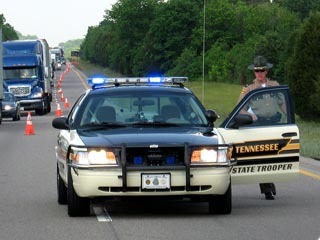 The Tennessee Highway Patrol will increase its highway traffic safety enforcement efforts on Saturday, May 5th, to coincide with Cinco de Mayo celebrations. During the 24-hour holiday period, Tennessee State Troopers will focus heavily on seat belt safety and DUI enforcement. The 2012 Cinco de Mayo holiday period begins at 12:00am on Saturday, May 5th and ends that same day at 11:59pm. One person was killed on Tennessee roadways during last year’s Cinco de Mayo period. The only fatality was wearing a seatbelt and alcohol was not involved. In 2010, four people were killed on state roadways during the 24-hour Cinco de Mayo holiday. Plan Ahead. If you plan to drink, arrange a safe way home before the festivities begin. Before drinking, designate a sober driver and give that person your keys. If you’re impaired, call a taxi, use public transportation, or call a sober friend or family member to get you home safely. Use the local Sober Ride program. Remember, Friends Don’t Let Friends Drive Drunk. If you or someone you know is about to ride with one that is impaired, take their keys and help them make other arrangements to get to their destination safely. As part of the Cinco de Mayo public safety awareness and enforcement campaign, the THP has scheduled saturations and sobriety checkpoints in high volume and high crash corridors across the state to look for aggressive and impaired drivers as well as safety belt violators. State Troopers will also conduct seat belt saturations, line patrols and bar checks this weekend. The YMCA Latino Achievers Program exists to “Illuminate the path to success, where students dream, discover their strengths, and plan for their future”. YLA was created to improve the lives of Middle Tennessee's Hispanic youth and families. The program is focused on mentoring Latino youth in order to help them realize their full potential. The YMCA Latino Achievers program is dedicated to helping this important and growing community achieve its fullest potential in spirit, mind and body. YLA aims to strengthen character and leadership skills as well as students’ academic achievement, in order to increase the high school graduation rate among Hispanic youth, and move on to higher education and eventually, career success according to their personal strengths. In addition, the program provides Latino youth mentorship with a focus on developing personal and professional leadership skills such as interviewing, communication, and a cultural appreciation component to build self-esteem and an awareness of their culture. Juntos Triunfaremos - Together, we will succeed! By giving to the YLA Scholarship Fund, you are building dreams and illuminating the path to success for our youth. Remember to tune into La Sabrosita this Thursday and Friday. Please pass this information along to friends, family, and community members, and encourage them to give by calling 615.743.6206 on those days or giving online at www.ymcamidtn.org/latinoachievers. YMCA Latino Achievers students and families are truly grateful for your support. The Radiothon will take place from 6:00am-6:00pm on Thursday, May 3 and from 7:00am-6:00pm on Friday, May 4. Please show your support to our area Latino families by donating to this valuable cause!